As a key sponsor of the Cabrillo Urban Island BioBlitz in San Diego, the CGA helped bring 250 High Tech High elementary school children to the park for a 24-hour BioBlitz on May 21st. 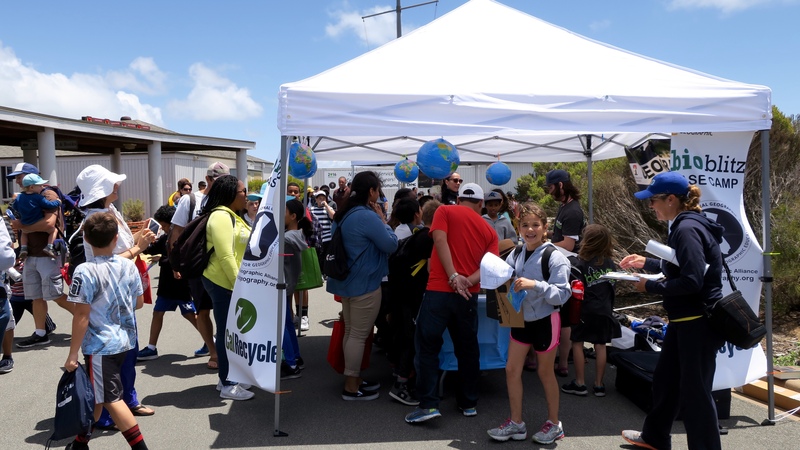 This very successful event was organized in coordination with National Geographic, the National Parks Service and 119 other participating parks across the United States. Kids had a wonderful time at the event. There were 68 exhibitors set up at the BioBlitz headquarters, offering an array of hands-on activities for kids. 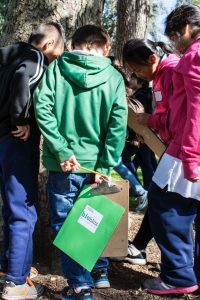 At the CGA exhibit, children had the opportunity to go on a BioBlitz scavenger hunt to help them with their map reading skills. Thanks to our SDSU Department of Geography cartographer, Harry Johnson, visitors were also able to examine an amazing air photograph and topographical map of Cabrillo National Park. Participants in the Cabrillo BioBlitz collected an incredible array of species observations. In fact, over the park’s 166 acres, citizen scientists logged 1,551 observations of 405 different species. This placed the Cabrillo BioBlitz as #3 in the nation for iNaturalist BioBlitz observations! Good news: This week is Geography Awareness Week! Why do we need Geography Awareness Week? Because in order to become well-informed global citizens, American students need geography education. As the world becomes more interconnected through globalization, geography education can help us make sense of rapid global change. This is essential, particularly in light of political and military interventions abroad. For instance, when Russia moved into the Crimea in March 2014, a survey revealed that only 1 out of 6 Americans could locate Ukraine on a map. The further Americans believed Ukraine was from its actual location, the more they supported US military intervention (Washington Post, 2014). This is a problem. Geography as a discipline has changed substantially over the last several decades. We do a lot more than maps! In our department at San Diego State University, our research spans the social and physical sciences. We study everything from vegetation, climate, hydrology, and soils to urbanization, migration, sustainability, and globalization. Many also specialize in Geographic Information Science (GIS) to develop applied solutions for real world problems. For this year’s Geography Awareness Week, the theme is ‘The Future of Food’. By exploring the geographies of food, we gain a better sense of how the food we eat is part of a global commodity chain linking people, places and environments around the world. 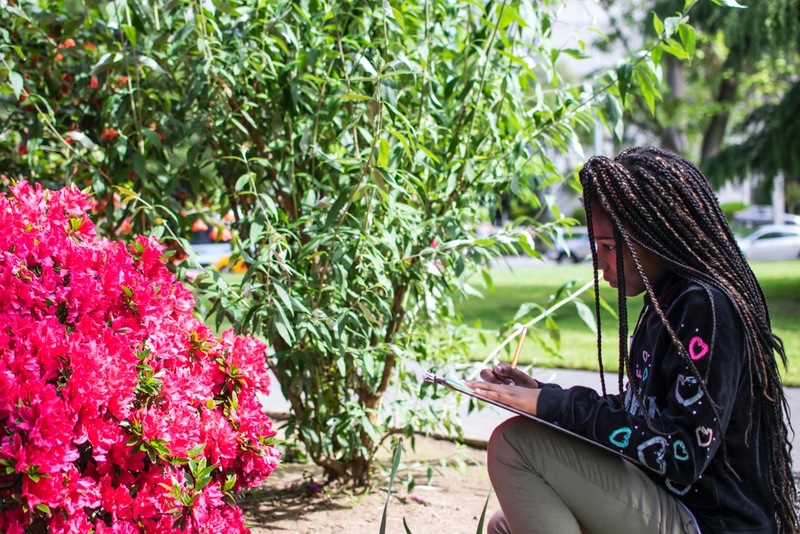 The California Geographic Alliance, along with National Geographic, invite students, teachers, and community members to participate in GeoWeek 2014. GeoWeek is an opportunity to learn more about geography, while drawing attention to the need for policies to improve American students’ access to geography education. Get started by going to GeographyAwarenessWeek.org, where you can discover ways to participate in GeoWeek and find ideas and free resources to organize your own GeoWeek celebration. Celebrate GeoWeek and spread the word about the importance of geography education! Your new CGA leadership team has been working hard to build exciting and innovative collaborations to help promote geography education in California’s schools. We recently had an opportunity to collaborate with the Academy of Our Lady of Peace (OLP), a high school that has been teaching girls in San Diego since 1882. 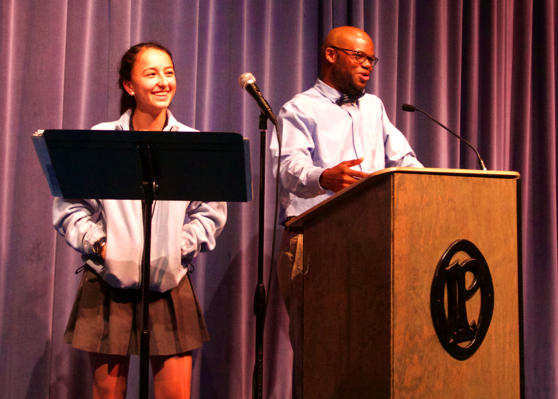 Working with English teachers Katie Turner and Laura Rodriguez, we helped develop an exciting sophomore World Literature curriculum that focused on geo-literacy and girls’ global education and empowerment. Today I’m going to give an overview of this collaboration. In next month’s newsletter, you’ll hear from one of the school’s World Literature students as she gives her thoughts on how the curriculum fostered her desire to change the world for the better! The following month, we’ll hear from teachers Katie and Laura as they describe their World Literature curriculum in more detail. We hope their curriculum might serve as a model for how to incorporate geography education into the classroom in engaging ways. World literature, states Alexander Solzhenitsyn, is “the one great heart that beats for the cares and misfortunes of our world, even though each corner sees and experiences them in a different way.” This quote, taken from the OLP World Literature syllabus, captures a major goal of the curriculum – to help girls step outside of their comfort zones in order to help them understand global social and environmental issues through a different lens. The books they read and the films they watched spanned Norway (Ibsen’s A Doll’s House), Zimbabwe (Dangarembga’s Nervous Conditions), Iran (Satrapi’s Persepoli), India (Mehta’s Water), and New Zealand (Caro’s Whale Rider). Each student in the class was also assigned a country to profile. Their task was to explore national level geography, culture, politics, and economics in order to explore factors affecting women’s and girls’ literacy levels in each of their assigned countries. To help further their understanding of girls’ struggles around the world, the CGA purchased and screened the film Girl Rising. This film shares girls’ struggles through powerful story telling. By focusing on stories from Cambodia, Haiti, Nepal, Egypt, Ethiopia, India, Peru, Sierra Leone and Afghanistan, it demonstrates how educating girls can have formidable impacts across families, communities, nations, and the world (http://girlrising.com/). We then helped bring three keynote speakers to create a speaker symposium for the 120 girls enrolled in the World Literature program. All of the speakers were invited to share their own personal journeys, as well as their work. The first speaker was yours truly. I shared my story on how I became a geographer, and also spoke about some of my work with migrant youth. We then invited Kenton Hundley, an award-winning spoken word poet, who works at a safe house for unaccompanied minors. Kenton blew the girls away by sharing his powerful poetry about the Latin American youth who risk their lives to journey to America. Our final speaker was Professor Doreen Mattingly an outstanding geographer and feminist scholar who is currently Associate Professor in the Department of Women’s Studies at San Diego State University. 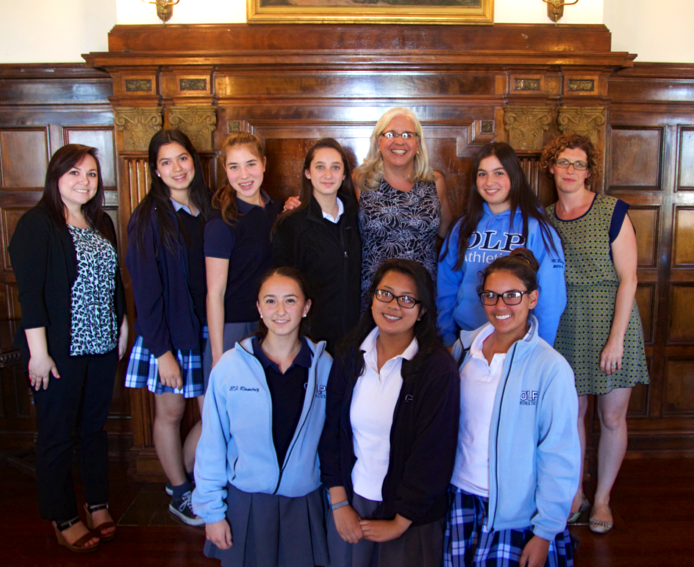 Professor Mattingly’s words inspired the girls to pursue their goals and strive to make the world a better place. Finally, we sponsored a geo-literacy essay contest. The prompt was: How does our study of girls around the world help us better understand the true meaning of the world hero? There were many excellent essays (we had 7 honorable mentions! ), demonstrating the power of this curriculum to inspire. 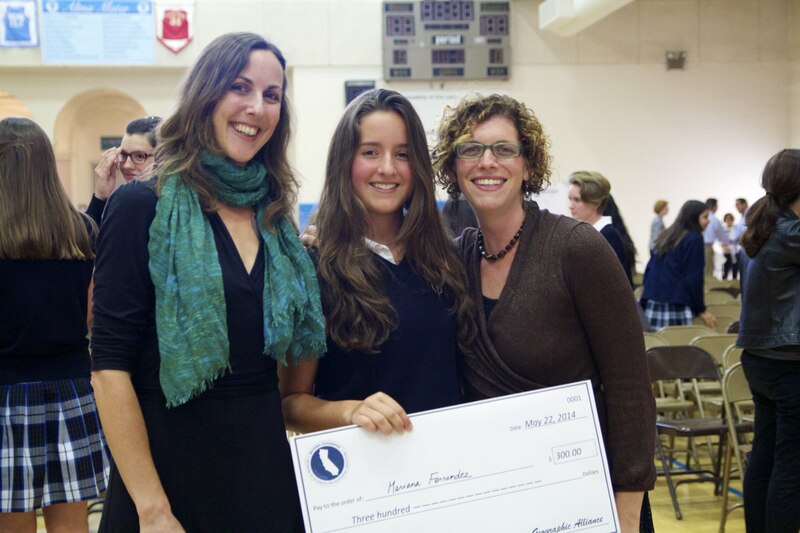 The winning essay, written by Mariana Fernandez, will be featured in next month’s newsletter. We presented the award to Mariana at a large sophomore awards ceremony attended by students, parents and teachers. Congratulations, Mariana! I hope you all enjoy her excellent essay next month. For teachers out there who are incorporating geography into their classrooms in innovative ways, we encourage you to get in touch with us. We hope to profile the work of other teachers on our website (www.calgeography.sdsu.edu) and in this newsletter. By doing so, we can help spread geo-literacy around the state!